What’s currently happening on this planet and especially the United States? Thousands of birds fall from the sky, dead! Tens of thousands of fish washed ashore, dead! Earthquakes are popping up in unexpected places. It turns out that the New Madrid fault is waking up. This flaw is six times greater than that of St. Andreas in California. It covers Illinois, Indiana, Missouri, Arkansas, Kentucky, Tennessee and Mississippi. 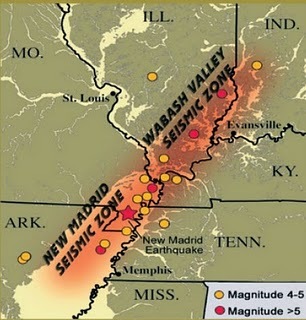 The largest earthquakes in the history of the United States were caused by the New Madrid fault. But now it is feared she wakes to become more deadly than it was already. Indeed, there are 200 years in 1811 and 1812, there were four almost consecutive earthquakes in the area of the fault with a magnitude of 7 to 8. These earthquakes created deep cracks that affected the course of the Mississippi and were felt to Boston. The most recent earthquake that struck the region was that of Dale, Illinois in 1968. If an earthquake as announced were to occur today, cities such as St. Louis, Missouri and Memphis, Tennessee would be totally destroyed. Unfortunately, there is no exaggeration. And BP British Petroleum could have sparked this renewed seismic activity. 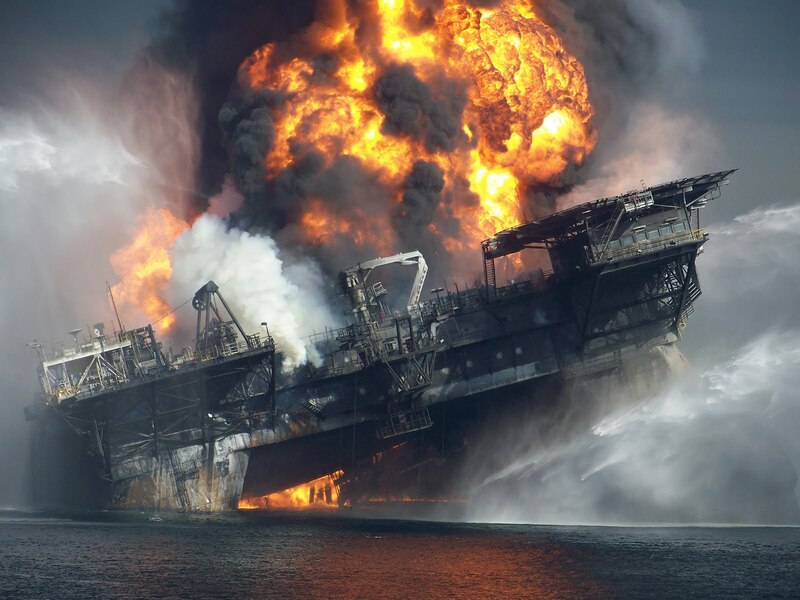 In April 2010 the terrible « accident » of the offshore drilling platform Deepwater Horizon. Something really fishy, as usual, is happening in the oil industry. 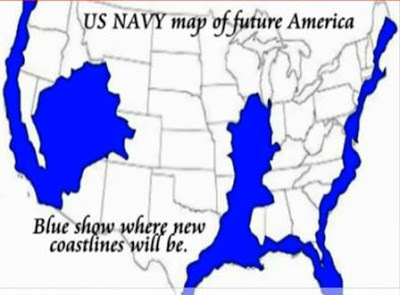 And it also relates to the Gulf. Several newspapers recently announced that BP was allowed to resume drilling and even start new wells in the explosive Macondo region where the last catastrophe occurred. Yes, crazy corporate greed at the very least. Oil giant BP plans to restart deepwater drilling in the Gulf of Mexico this summer just a year after the Deepwater Horizon explosion that led to the worst oil spill in history. The group hopes to start work on 10 wells in the Gulf after obtaining authorization by the U.S. authorities to continue the interrupted job when drilling moratorium imposed after the spill. The decision is cause public anger, coming just a year after the devastating oil spill that occurred when a BP well exploded, killing 11 workers and causing an environmental crisis. This authorization is reported to have been given by a judge, but was subsequently denied categorically, and articles on this authorization seem to have been carefully removed from the net. Here is the official denial. The U.S. Department of Interior on Monday rejected media reports as what BP was en route to an agreement resume deepwater drilling in the Gulf of Mexico, a year after the worst oil spill in U.S. history. British media said that BP was in talks with the U.S. government to restart drilling of wells less than a year after the explosion of the Macondo Deepwater Horizon. Do not worry, they’ll get their permission. It is « test the waters » so to speak. Every day millions of gallons of oil are extracted from the Gulf and the Mississippi River basin, on the way to the heart of the fault line of New Madrid from Arkansas back to Illinois and Indiana. Hydraulic fracturing (called « fracking, » or « Hydrofracking ») is a process that results in the creation of fractures in rocks. The fracture is from a well drilled in pockets of rock formations to increase the efficiency and maximum recovery of oil and natural gas wells. Hydraulic fractures may be natural or artificial and spread through the internal fluid pressure which opens the fracture and causes it to extend through the rock. Natural hydraulic fractures, are volcanic pits, grooves and fracturing by ice action during freezing weather. Fractures caused by man by fluid injection are started deep into a wellbore and expanded in targeted formations. The spacing of the gap is generally maintained after the introduction by injection of a proppant into the injected liquid. The proppant is a material based on grains of sand, ceramic or other particles, which prevent the fractures from closing when the injection is stopped. 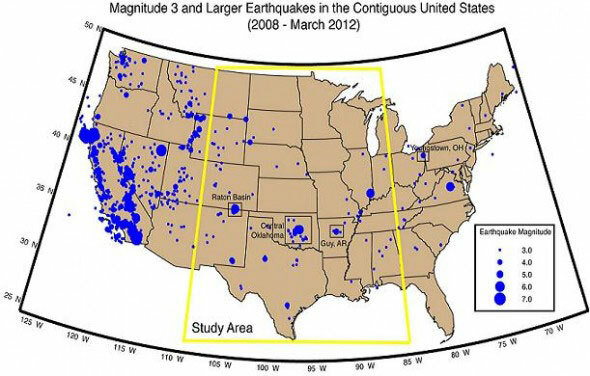 Map of earthquakes related to fracking in America. The oil industry is a parasite that destroys the earth as would giant mosquito sucking blood while injecting an infected liquid instead. Yes, the « invasion » is running and long. Under minimal supervision of the federal government, a myriad of chemicals is injected into the ground in the name of energy exploration in the West. Among these chemicals, biocides are considered to be a serious threat to public health and the environment. Hydraulic fracturing, known as « fracking » or « frac’ing » for short, is the process about 90 percent of oil wells and gas in the United States suffer for easy extraction. Biocides are used to kill microorganisms that may interfere with other fluids and methods are used to stimulate the extraction and prevent corrosion of pipes. In 2005, the oil and gas industry was granted an exemption to the « Act respecting the safety of drinking water, » which allows the injection of toxic fluids directly into groundwater without oversight by the U.S. Environmental Protection Agency (EPA). Before the adoption of this policy, the EPA conducted a study which concluded that fracking is a minimal threat to underground sources of drinking water and does not determine warrant further study; the study has been criticized both inside and outside the agency. Despite the concern of public health professionals and landowners who have been victims of contaminated water themselves (read the story of Laura Amos), the agency continued to require a minimum regulation of the industry . A little hard to imagine? Not when we know who are the controllers and how they are directed. We speak not only bad people, greedy, but the intentions of a lot of them are seriously evil. Not all, because several are all dupes willing to take the train route. Have prior knowledge of the potential effects on human life and health of our planet and still make pressure on government agencies to comply with their desires, it takes more than greed. And underlings just have to follow. 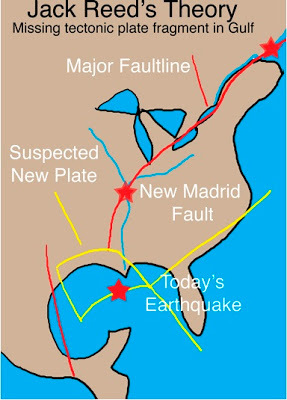 Line New Madrid fault is listed in the red box below, but it is assumed that it extends farther to the Gulf of Mexico. There was serious earthquakes in the past, most recently in the ongoing story was of a magnitude of 7 and 8 in 1811-1812. Earthquakes of 1811-1812 New Madrid earthquakes were intense at the plates and started with two strong earthquakes December 16, 1811. These earthquakes remain the most powerful ever to hit the eastern United States . 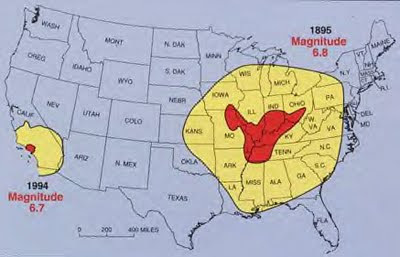 These events, as well as the seismic zone where they occurred, were named in connection with the city of New Madrid on the Mississippi, Louisiana Territory, now Missouri. It is believed that earthquakes were felt strongly about 130,000 square kilometers, and moderately nearly 3 million square kilometers. The earthquake history of San Francisco 1906, by comparison, was felt moderately over about 16,000 square kilometers. The following map shows the range of effects mentioned above in comparison with the earthquake in Los Angeles in 1994. The great earthquake of Charleston in 1895. Really serious. This is due to the nature of the rock in this region that transmits energy more efficiently in the Los Angeles and California. Emptying of large cavities and cutting the basement, you can expect to get repercussions. Especially if it is just along a known fault line. News: Earthquakes in Greenbrier Arkansas increasing at the same rate as natural gas drilling and fracking! Arkansas faces directly to the New Madrid fault. People in the region of Greenbrier Arkansas are certain of one thing: that drilling and fracking increased in their area as well as earthquakes. A resident of Greenbrier, Dirk Deturck lives on a ridge between Guy and Greenbrier. He looked at the platforms. Once they have increased drilling and fracking near Greenbrier, earthquakes in Greenbrier began to increase in intensity and frequency. « They really feel differently now. » Deturck said. He described the sensation as waves rolling from below and when it hits, it sounds like a « boom ». He believes that the injection well has a lot to do with earthquakes, but condemns all activities including fracking stations and compressors. During the snowstorm, Deturk noted that all gas activity stopped: no compressors running, no drilling, no fracking and no injection. Guess what? He said he considered the USGS data and there were no earthquakes in three days of snow. He also noticed a swarm of small earthquakes Tennessee side of the Mississippi River on the same day as other more important Greenbrier. He fears that gas production could trigger a « big one » may be located off the New Madrid fault. We had many experts AGS that this insurance will probably never happen, but they always tell us to make plans for emergency preparedness. Interesting. No wonder it is one of the few voices. Today, science is made to stick to the needs of business and politics, and not the reverse. And they want to continue to drill there? Yes I do. The bulge of methane appeared after the explosion of the Deepwater Horizon is directly in line with the New Madrid fault. And you think they do not know what they do? Really hard to believe. At least this is criminal irresponsibility. So while drilling continues officials are preparing to rescue drills in case. Go figure. They even have a website. Surreal. Two exercises earthquake preparedness in Indiana, the « Great Central U.S. Shakeout » scheduled for April 19, and a training program in May to management agencies and emergency solutions receiving increased interest after the devastating earthquake Japan. The people of Indiana have good reason to prepare. Experts say it is only a matter of not if but when Indiana will be shaken by a major earthquake on the New Madrid seismic zone or New Wabash Valley. And soon again in the volcanic area of ​​Macondo. 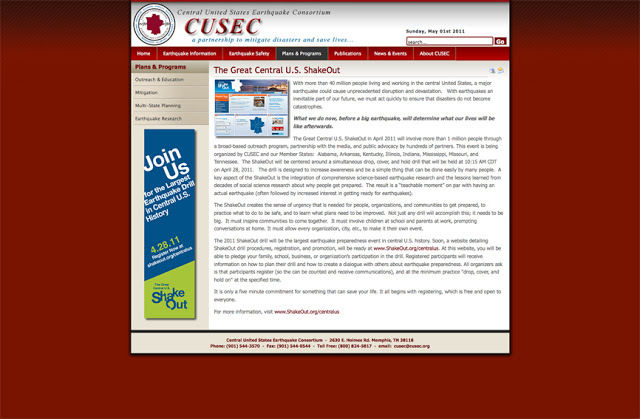 Before continuing here is a screenshot of the famous site CUSEC. You should know that it is the Zionist Jews who are at the head of this monstrous strategy. They want to destroy humanity for the simple reason that they are just for that. It is their mission and their only reason for being on Earth. Again, I repeat ALL in ALL AREAS HAS BEEN REVERSED. YOU MUST BECOME AWARE THAT EVERYTHING HAPPENS ON EARTH IS CURRENTLY SPONSORED BY THE ZIONIST JEWS, ALLIES TO ILLUMINATI WHICH LEADS TO THE LIST ROTSCHILD ROCKEFELLER AND WHICH I WILL GIVE YOU THE EVIDENCE OF THEIR Jewishness IN NEXT ARTICLE ON MONSANTO. I do not know if HAARP is involved in the Japan disaster (tsunami of March 11, 2011), but the thing I do know is that the Jews hate Japan. By cons, HAARP was very involved in Haiti. And I can also tell you that the Israeli security companies now control more than 70% of prisons and the electronic and nuclear systems of the U.S. Army. Simply start by fix an anti -malaware program and check it everyday. Made attention to Facebook :actually with a lot of problems. Choice minimum 2 different antivirus and check every 2 days…with alternance.